Vintage Mother’s Day Illustration – Charming! This is a charming Vintage Mother’s Day Illustration! Featured here is a sweet image of a Mother with her two Children. They are taking a walk in a Garden on a pretty Spring Day. If you look closely you can see a mama Cat with her Kitten sitting on the Garden Wall! 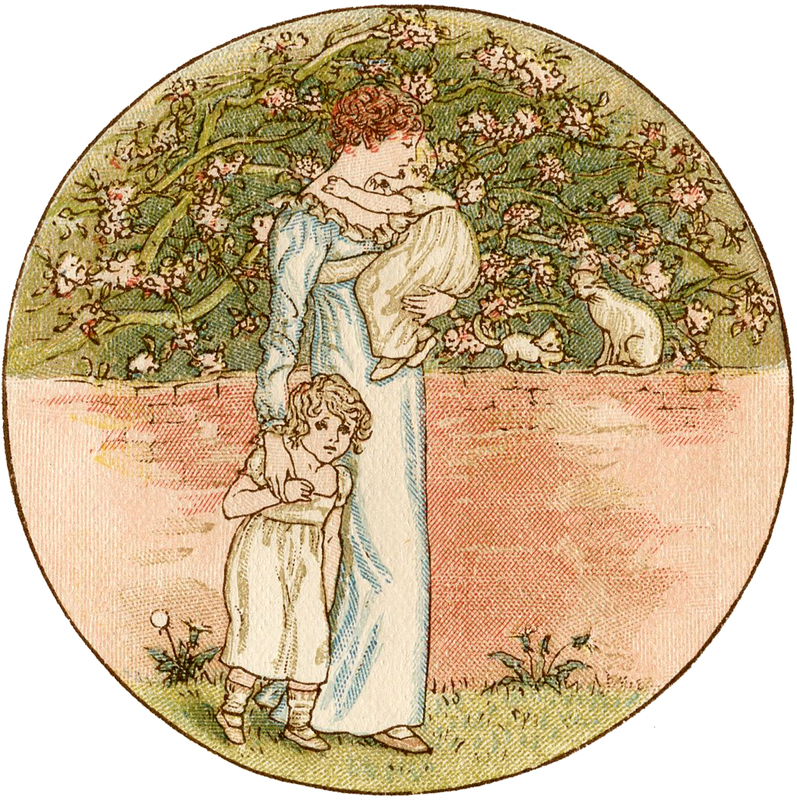 This illustration was done by one of my favorite Artists, Kate Greenaway. You might also like another adorable illustration from the same book, you can find that one HERE. Just thought you would like to know that there seems to be a kink on your site. Using my email notification, and clicking on the “Graphics Fairy” header, I can not access anything after March 27th. This is how I have always gone to your most recent posts from my email notifications. Once on your site, even hitting “Home” will not allow me past March 27th. Only clicking on the blog post title for each post from my email, will allow me to access your most recent posts. If it makes a difference, I use Firefox for my browser. Thanks. Your images are so wonderful, and you do so much work for us, it would be a shame if others are missing your posts. I think it might be a problem with your cache. Try clearing out your cache and see if that fixes it for you. I tried clicking on the email, but I couldn’t duplicate the problem that you are having. Let me know if that works!! Like most computer problems, this one is fixed without any action on my part. Thank you so much for taking the time to answer the comment, and I will keep your advice to use on another occasion. Your efforts are great appreciated. Hi – love this Mother’s Day illustration. Is this a free printable? Karen my dear, this is an illustration by Kate Greenaway. I LOVE her illustrations. Your image here comes from her book “Language of Flowers”. I’m fairly certain there is no copy right infringement in using her illustrations. I just wanted you to know the wealth of vintage images her body of work provides. Hi Denise, Yes, I did credit Kate Greenaway in the description above, I think you must have missed it! She is one of my favorite artists! I will be sharing more images from her books each Saturday, so stop back to see more of them. I have 2 of her books in my collection. I scan mine at a much higher resolution than Gutenberg does, and they get cleaned up too, so hopefully you will find them useful for your projects. 🙂 I’m glad to know there is another Greenaway fan her besides myself!! Oops! My bad. I now see your reference to Kate in your description. So sorry. I hate it when readers do what I did! Now I have more grace toward those that don’t read fully or don’t retain what they see. I find myself doing this so much lately as I care for my parents since they were both diagnosed as having cancer within a week of each other. That was 3 months ago. 2 surgeries, chemo, scans and ongoing treatment has exhausted us all. I always look to your daily offerings to take my mind to different, more enjoyable, places during my “me time” each day. So, in all humility I thank you for all that you do in providing such excellent images for free! You are much appreciated. How sweet. What a lovely mood piece. This is so lovely. I really appreciate Kate Greenaway too. Her images are gentle and loving. Oh my goodness Denise! No need to apologize! You certainly have a lot on your plate, I’m so sorry to hear that both of your parents are ill, that must be so difficult for you. I will keep you and your family in my prayers. Blessing and hugs to you sweet friend.